AmeriSpec of Calgary & Red Deer is a proud franchisee of the AmeriSpec of Canada family, offering The AmeriSpec Home Inspection - a visual inspection of over 400 items including the foundation, roof, and structural components, plus visible electrical, plumbing and mechanical operating systems of the property. AmeriSpec InspectionExperts are highly-trained, licensed, certified Calgary home inspection professionals. We are a proud part of one the strongest and trusted few, North America franchises in the Home Inspection field today. More than 150+ independently owned and operated franchises conduct more than 80,000 professional inspections annually in the Canada and United States. We are helping to set the standards for the home inspection industry with our commitment and integrity to our profession. Our 400+ inspection findings are packaged in an attractive, easy-to-reference, three-ring binder. 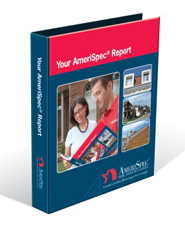 The AmeriSpec Report™ - the industry's gold standard - features a comprehensive evaluation of the home, a Seasonal Maintenance Checklist, and access to our Home Owner Rewards Program which contains valuable savings offered by our partners. "The right inspector, right away." For a free sample report, contact us with your name and email!